Economic relative humidity sensor for low cost applications. 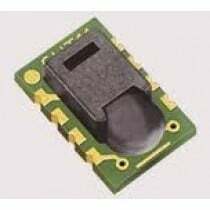 SHT11 digital humidity and temperature sensor is the low cost version of the reflow solderable humidity sensor series. The accuracies have been opened to a level that guarantees a very competitive price. The capacitive humidity sensor is available up to high volumes and as every other sensor type of the SHTxx family, it is fully calibrated and provides a digital output.